In this paper, we report on the use of a double treatment based on porous silicon and Cr-doped TiO2 sputter-deposition, as a novel passivation technique for monocrystalline Si (c-Si). The passivation and antireflection properties of these treatments were investigated. In particular, effect of Cr doping concentration (in the 0-17 at. 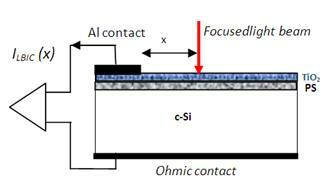 % range) on the optoelectronic properties of c-Si was investigated. It is particularly found that the PS/TiO2 (2 at. % of Cr) treated samples present high photoluminescence (PL) intensity and an enhancement of the optoelectronic properties of the c-Si material with respect to other Cr doping concentrations. Consequently the total reflectivity, in the 350 - 700 nm wavelength range, decreases from 35% for untreated c-Si to about 13% after PS/TiO2 treatment and the effective minority carrier diffusion length of the c-Si was enhanced from 181 µm to 340 µm after combining porous silicon and Cr-doped titanium dioxide deposition.